Cherry Mobile is setting itself up to get a few more headlines it seems as its gearing up a new extremely budget Android phone. 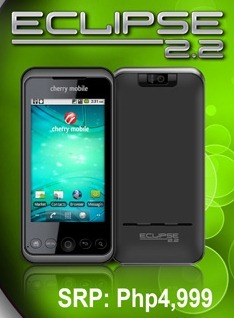 According to YugaTech, this time they’re adopting the WinMo Eclipse 2 into an Android 2.2 powered dual-SIM phone. The new product is called the Eclipse 2.2 and will run Google’s mobile OS. It’ll have some processing-power deficiencies, but hopefully will do the trick. For the price of PHP 4,999, it just might attract some Android newcomers. The Eclipse 2.2 is an Android 2.2 Froyo device with some slightly under-powered internals. First off, it has a resistive screen – so no multitouch and you’ll need to press the touchscreen a little harder. Speaking of the screen, it is 3.2 inches running at 432×240 resolution. Slightly better than 320×240, but not as good as the 320×480 that we’re seeing these days. As for processor power it only has 416Mhz – which should run, but let’s not expect any decent gaming to be had. For imaging it has a 2MP camera, but we’re not sure if it has a front facing one or a flash. Finally, the main draw here would be its dual SIM, dual standby capabilities – although the specs does seem to point out that it has no 3G capabilities, so don’t expect that if you’re interested in this device. Overall, the specs seem like a reasonable sacrifice to bring the prices down. However the audience for this has got to be the most frugal buyers of smartphones ever – opting to not just bring their budget up a few thousand pesos and buy a 600Mhz or so device under 10k. Still that niche does exist, so if you’re one of the interested individuals, you can hopefully check these out soon at your nearest Cherry Mobile stores. You can peep the full flyer below. Ow, this is very affordable for a dual sim and android all in one, however, I’m not sure if user can enjoy the android apps. I hate my android experience using their nova phone. It always crash and lost most of my files. It couldn’t accommodate photo-related apps, if you I insisted it will hang up. Definitely won’t satisfy you if you’re using the Nova already and not satisfied with it. This phone has an even slower processor than your Nova and has a resistive touchscreen. Best to upgrade to something better with a better processor and capacitive screen. This phone is best only for users who are not so picky about the performance of their phones and need an extremely budget dual-SIM Android phone. can i put a dictionary application on this phone? Hi Arlone! Yup, you should be able to do that since the phone should have access to the Android Market. There’s a lot of dictionaries that can be downloaded there. Hope that helps! We haven’t been able to test an Eclipse 2.2 so we wouldn’t know if its good. But hopefully if we can get to try one we’ll let you know! Comparing it to Samsung Corby2.. Which one would you suggest is much better against cherry’s eclipse 2.2? Hi Lorrens, sorry for not being able to reply sooner. We think its better than the Corby especially since you’ll be able to install Android games. But we suggest going for something a little higher in spec so you can get a capacitive screen and higher processor speed. This should allow you to get more apps and functionality from your phone. One such device you may want to look at is the DTC phone we’ll be unboxing soon. 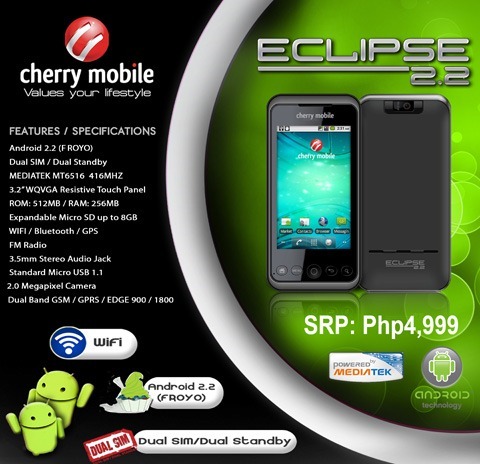 Its an Android 2.3 device with capacitive 3.5″ 320×480 and dual-SIM for only PHP 4,990.
hi! dati aqng samsung corby user.. then naabutan q ung cherry mobile sa trinoma na sale, then na gustuhan q ung cherry mobile eclipse.. qng difference pag uusapa.. i suggest na mas maganda ang cherry mob eclipse than samsung corby 2..